Taken with Olympus E500 digital camera September 16th 2007. Click image for larger view. 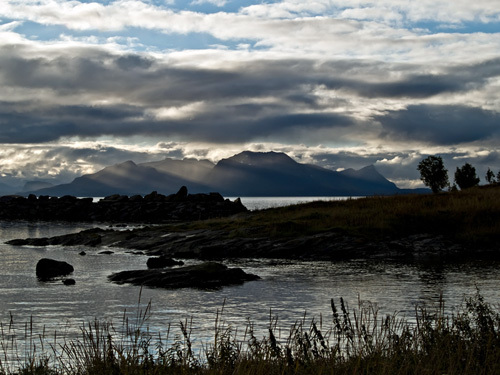 In this photo you can see typical coast landscape in northern Norway with the seawall and mountains sticking up from the ocean. I love the way the sunbeams come out of the clouds and make the special light against the mountains. There is even some small patches of last years snow in the mountains. It’s very beautiful, even if it looks pretty cold! You are right – the larger size is even more gorgeous! Shaun: The skiing and snowboarding is very good, but you have to walk to get to many of the peaks. Looks like I’ll have to add some more pics to ye olde Google screensaver. Currently at 47, but I’m missing a lot of them. I wish there was a way I could link directly to your rss feed so it would constantly update your pics, but when I do it says your feed has no pics. This would be the cats pajamas as it would update the screen saver any time you posted. Plus include every photo not just the ones I upload to my picassa photo album. Maybe there’s something you can do with the feedburner rss settings. I’ll have to do some experimentuing and get back to you. Nate: I have set feedburner to show the images… and they do show up in the RSS reader.. weird. Yeah I don’t know. I use Thunderbird for my RSS and the pics are definetly there, but when I try to add them to the Google Screensaver it says there are no images present. Maybe there’s some sort of opt in feature in feedburner?? I’m not quite sure. Like I said I’ll have to do some homework. That’s really the right way to do it though. And it would likely help with your traffic offering something cool like this for free.